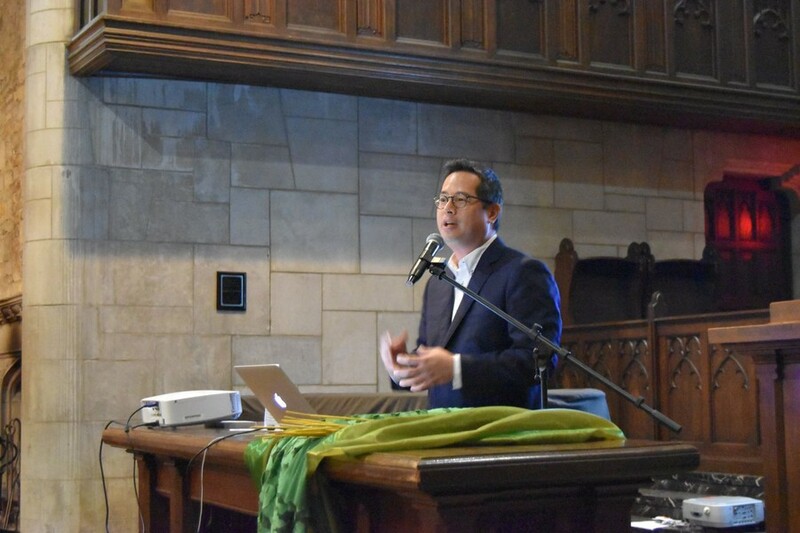 In his keynote address for the Office of Multicultural Student Affairs Heritage Series, author and hip-hop scholar Jeff Chang examined the role of culture as an instrument for political change. This question comes at a troubling time for America. Chang’s framing of the problem in terms of inequality resonates with issues currently dominating politics and the media. That inequality—especially racial inequality—has been growing for the past 15 years was his simplest but most illuminating statistic. Chang emphatically noted that black lives are “so visible, and yet so invisible still”: Reactionary movements like Black Lives Matter fight a battle for the centering of black lives, a call that reverberates far and wide. Most of the questions at the end of the talk revolved around issues of segregation in housing, schooling, health, and wealth. Paradoxically, America is at once growing more segregated and more diverse. “Diversity without equity is a lie waiting to be exposed,” Chang said—a claim particularly relevant to college campuses around the country. This year, the University welcomed “a diverse group of first-year students,” according to its official “Meet the Class of 2020” article; we students are acutely aware of issues of diversity and equality. Even UChicago Lab School students are organizing workshops to address such topics as art and activism, aiming to turn discussion into action. At the same time, our whole campus life stands largely sheltered from the rest of Chicago’s South Side. Part of the solution, as the framing on both sides of Chang’s talk by art suggests, involves turning our heads to performers and artists in the community. Chang proposes a cultural, creative revolution. Art is not just an outlet for negative frustration, but an elevated inlet of positive change. It is through cultural equity that wholesome equity can be reached. When three performers of Rebirth Poetry Ensemble stepped on stage, it was as if they were in dialogue with Chang. They responded to his call for cultural equity by singing that, despite the troubles, Chicago is where they will stay and make a life. Frustrated but not angry, they almost shouted the refrain. In a way, louder than Chang’s talk, their performance forces us to rethink how we can live together. At the same time, Chang fleshed out a nuanced relationship between politics and culture. The politico-juridical arena aims (with good intentions) to flatten out differences for the sake of equality. Yet art highlights these differences for the sake of an even richer equality—as was clear from the evening’s diverse performances. To answer Chang’s question, “Where does culture lead us?”—it leads us, on an infinite number of coexisting roads, forward. Local artists fleshed out Chang’s interplay of culture and politics: Aquil Charlton, a multidisciplinary artist from the South Side, performed a rap, followed by a cohort of students from the Lab School and singer Alex du Buclet. Chang also shared with the audience his burden of “creating new ideas, stories, and songs to convince people that the world that hasn’t been created is better than the one we are living in today.” This challenge proved irresistible to one member of the audience, who offered to play the piano after the talk, lending Chang’s book signing a background melo.